When you run you are actually airborne. You land somewhere on the outside of a single foot, usually at the heel. 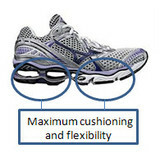 If you have a high arched foot, you are likely to have a rigid ankle. Feet of this type land on the outside heel, rock in a "Z" formation back and forth to dissipate shock, and push off on the ball of the foot. High arched feet go through the mechanics of landing and pushing off without any trouble, but because of their rigidity they are not great shock absorbers. This foot needs lots of cushioning from a shoe to help it do its job.